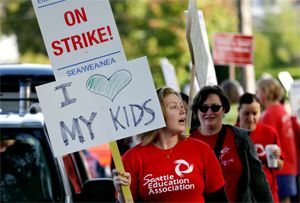 Seattle teachers are on strike starting Wednesday. If your children won’t be at school due to the strike, here’s where you can send them instead. Seattle Public Schools were set to start Wednesday, but with no contract agreement between the district and the teachers union, teachers have voted to strike. So, parents: Where can you send your children? Many community organizations are offering camps and other programs for Seattle students in their areas. For example, the YMCA will have a Back to School Camp from 7 a.m. to 6 p.m. starting Wednesday, and the Wallingford and Coe Boys & Girls Clubs will be open to registered students. Seattle Parks and Recreation after-school programs will expand into day camps, running from 8 a.m. to 5 p.m. Sept. 9-11. Parents or guardians can call to register children ages 5-12 for the day camps if they’re not already participating in the after-school programs. The 16 community centers holding the camps have room for about 850 children total. If the strikes continue past Wednesday, Pacific Science Center will hold day camps for students in grades K-5, from 8:15 a.m. to 4 p.m. on Sept. 10 and 11. Parents or guardians must pre-register their children, but will receive a refund if the strike ends and camp is canceled. The city’s Garfield, Meadowbrook and Southwest Teen Life Centers will open at 11 a.m., two hours earlier than usual. Public libraries will be open regular hours and offer their usual slate of programs for children and teens. The district has said that “at this point, the plan” is for athletic practices and events to continue as normal. City preschool programs will be canceled during the strike. Affected families can call 206-386-1050 for help finding child care. The YMCA’s full-day preschools will be on their normal schedules. The Community Day School Association’s school-age and preschool programs will be closed Sept. 9-11, but full day care will be available there from 7 a.m. to 6 p.m. starting the week of Sept. 14. Seattle Public Schools has compiled more childcare information here. You can find information about school activities here.